My overactive childhood imagination created a story to explain the "family recipe." David "Air"—who with a name like that was obviously a dashing pilot—was a distant relative whose brilliant pancake recipe had been carried on by generation after generation. Turns out I was only right about that last part. When I finally thought to research the origin of the breakfast delight, I found out that David Eyre was neither a pilot nor a relative. (I wasn't the only one who had it wrong. Josh Friedland of The Food Section called it "John" Eyre's pancake.) Eyre was actually an editor in Hawaii. And his name would be immortalized after he served the now famous pancake to New York Times food writer Craig Claiborne, who published the recipe in 1966 with the title "David Eyre's Pancake." So this morning, I was thrilled to see the recipe revived in The New York Times Magazine. Writer Amanda Hesser sums up the beauty of the dish, which is akin to Yorkshire pudding: "What keeps cooks faithful to one recipe is often some confluence of ease and surprise. David Eyre’s pancake possesses both. 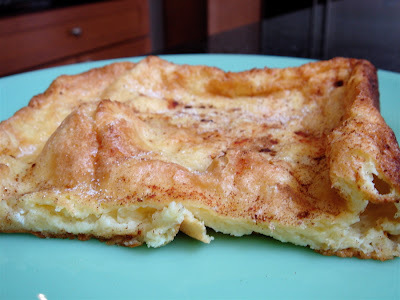 A batter of flour, milk, eggs and nutmeg is blended together, then poured into a hot skillet filled with butter and baked. Anyone confused? I didn’t think so." 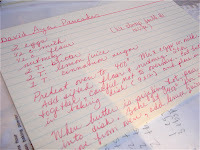 The recipe my mother wrote down for me years ago (pictured below, with the name misspelled) doesn't stray too far from the original. But for a family of five, we always doubled it and used a 9x13 inch glass dish instead of a skillet. I've done the doubling math in the following recipe. Preheat oven to 400 degrees. Mix eggs with milk. Add sifted flour and nutmeg. Stir together, careful not to overmix. Put butter in a 9x13 inch baking dish and place in heated oven. 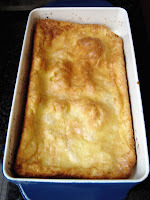 When butter is sizzling hot, pour batter into dish. Bake for 20 minutes. Remove from oven and sprinkle with lemon juice and cinnamon sugar. Cut and serve plain, with syrup (my favorite) or jam. Note: Doubling the recipe means the middle doesn't puff up as much. I can't wait to try this ... this morning. This does look good. And, anything that moves some part of breakfast from the stovetop to the oven makes the task of preparing a gluttonous weekend feast that much easier.